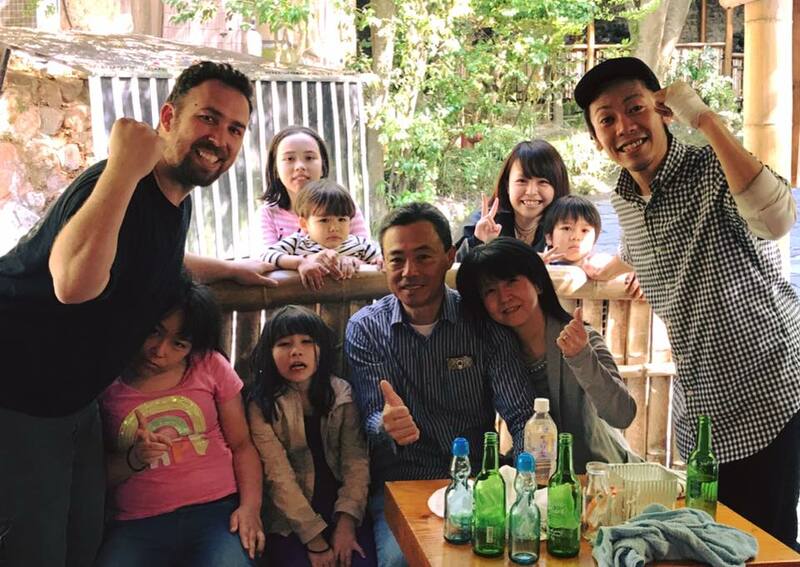 This family is from Kita Kyushu City and they found about Jesus in an amazing & jaw dropping way. It has been a month since I had an encounter at a hot spring in Yufuin. A popular hot spring get away in Oita about 90min drive from where we live in Fukuoka. This healing happened in a very unique situation and potentially embarrassing situation. If you know about Japanese hot springs you will know what I am talking about. First of all everyone is naked and secondly people don't talk to one another. It is sort of an unspoken rule. However I found myself instead of enjoying the scenery and the hot spring alone with my thoughts distracted by a young man who had a plastic glove on his hand. Something was obviously wrong with his hand and I began to think/ ask God, "Is there something here. Do you want me to pray for this man, naked in front of all these other people? Of course I can almost sense the LORD laughing saying, "Will you go?" I continued in prayer and I said to God, "Ok if you make him sit in front of me face to face I will go and put my hand on him and you will heal him." After a few minutes the young man suddenly got out and I thought to myself. Well I guess it isn't going to happen. Then I moved slowly to where he was sitting in case he came back. I looked behind me and I saw him washing himself which usually is a sign that a person is leaving. He was grimacing from the pain in his hand. I sighed and looked up to heaven. When I looked back to the water in a few minutes, suddenly the young man returned and sat right in front of me. I looked at him straight in the eye and smiled and stood up and asked him what was wrong with his hand. I stood before him completely naked, exposed, literally nothing to hide. But what could I do the LORD had done this!! I continued to ask a few questions if he could move it or how bad the pain was. He said it was broken and he could not make a fist. I said "I pray for people and God heals them. Let me see your hand." And to my surprise he put it out and I took hold of it with both my hands. I told the pain to leave and spoke to the bone to heal. I then breathed on it twice. I said make a fist. The young man was stunned as he was able to make a fist. I asked him if there was any pain at all. He said a little at the very end. I did the same thing again and this time I closed his fist completely tight with my hands clasped on it. He tested it again and the pain was gone. Wholeness and strength was back to the hand. The bone was healed and he could make a fist without any problems. I told him about Jesus. I said He is the one whose name I did this in. Later the young man and his family met up with mine and we took a picture together. He was even holding a heavy bag with hand. He made a fist for the photo and he and his family know that JESUS is real and that His Gospel is not a fairy tale.